Some of the biggest-named charities in America walked away from President Trump this week. The exits continued into the weekend, making eight cancellations. On Saturday, the Palm Beach Preservation Foundation became the latest Trump customer to put its foot down. "Given the current environment surrounding Mar-a-Lago, we have made the decision to move our annual dinner dance," the foundation said via Twitter. The exodus comes amid backlash to Trump's widely criticized remarks in the wake of a violent white supremacist rally in Charlottesville, Virginia last weekend. Three major national organizations -- The American Red Cross, The Salvation Army and Susan G. Komen foundation -- and one local charity all said Friday they were canceling events at the Palm Beach resort. That came after three charities and organizations made similar announcements on Thursday. The cancellations follow the spectacular implosion of Trump's business councils this week over the president's insistence that counter-protesters shared the blame for violence at a white nationalist rally. Now, Trump's words seem to have hurt his own business. While a couple of organizations that decided to pull their business from Mar-a-Lago did not cite a reason, most named the current political climate as the reason for the move. "The American Red Cross has decided we cannot host our annual fundraising event at Mar-a-Lago, as it has increasingly become a source of controversy and pain for many of our volunteers, employees and supporters," the organization said Friday. The Salvation Army also pulled its Holiday Snow Ball off the venue's events list "because the conversation has shifted away from the purpose of this event," spokesperson Kurt Watkins said. The Ryan Licht Sang Bipolar Foundation joined the roster of cancellations Friday afternoon, saying the group "stands with the Palm Beach community and has canceled its 5th Annual Bipolar Medical Luncheon at The Mar-a-Lago Club." The Palm Beach-based foundation said it would host the luncheon at a different location at a later date. Yet another philanthropic event could also be on its way out. The president of Leaders in Furthering Education on Friday urged the board of her charity to abandon Mar-a-Lago for the organization's annual Lady in Red Gala, slated for December 2. "The hatred, vitriol and anti-Semitic and racist views being spewed by neo-Nazis and white supremacists are repugnant and repulsive -- and they are antithetical to everything that this country, and I personally stand for," LIFE President Lois Pope said in a statement. "And anyone who would demonstrate even a modicum of support for them by insisting that there are 'good people' among them is not deserving of my personal patronage or that of my foundations." It's not clear when or if the board will approve the move. 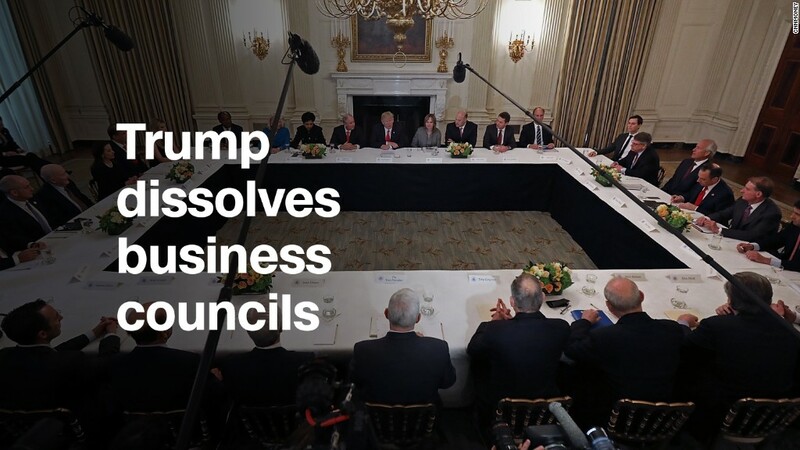 Cleveland Clinic did not provide a specific reason for its decision to pull its annual fundraiser off Mar-a-Lago's events calendar, but Toby Cosgrove, the hospital group's CEO, was among the first executives to quit Trump's business councils in protest to his remarks about Virginia. It'll be the first time in eight years the hospital group will not hold its annual fundraiser at the club. Also on Thursday, The American Cancer society said "it has become increasingly clear" that hosting its fundraiser on Trump-owned property presents a "challenge" to its values. The group has hosted fundraisers at Mar-a-Lago every year for the past decade. The American Friends of Magen David Adom, a group that supports Israel's national ambulance, blood-services and disaster-relief organization, confirmed Thursday that it, too, has decided to move its annual gala to another location. "After considerable deliberation, AFMDA — an apolitical and humanitarian aid organization — will not hold its 2018 Palm Beach Celebration of Life Gala at Mar-a-Lago," spokesperson Erik Levis said in a statement. The organization declined to give a reason. Two organizations that have announced plans to hold events at Mar-a-Lago in the coming months confirmed they'll go ahead with their plans. The Palm Beach Police Foundation said it would still host its annual black-tie dinner dance at the club on January 6, 2018, citing its deposit and the size of the venue. The Kravis Center for the Performing Arts confirmed it will host a wine auction at the club on Feb. 1. Mar-a-Lago declined to comment for this story. The Trump Organization did not immediately respond to a message.